With winter on our doorstep, ahead of the imminent festive season we are presenting you with our exclusive and time limited Xmas Promo. 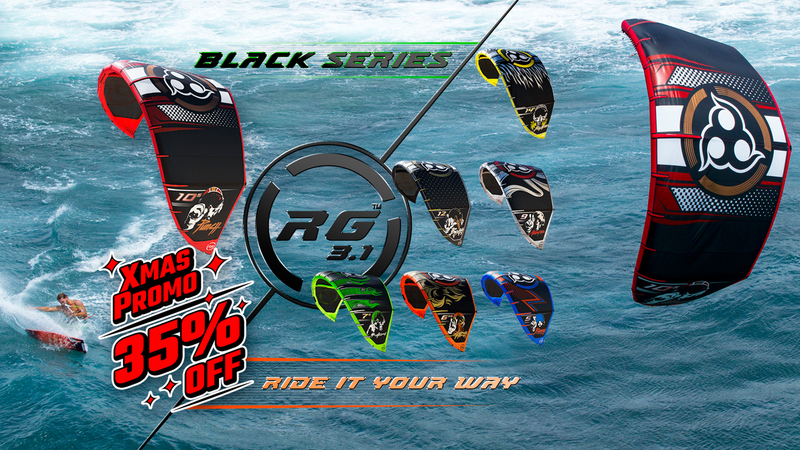 Combining the best of both worlds, RG3.1 for ultimate wave-freeride experience and ManiaC 2.0 for that freestyle-wakestyle performance, together with full spectrum of amazing Twin Tip boards collection this is by far the biggest promo in our history. Only now you can purchase any Kite or a Twin Tip board with 35% discount from regular retail prices and a massive 45% off when buying a Kite + Twin Tip board package! With limited numbers of kites and boards available in our promo, we strongly advise you to hurry up and order your set before its too late – find your nearest stockist at our Store Locator or shop online with Wainman Hawaii. Offer valid worldwide, from 24th of November until 31st of December 2016 or while stocks last - orders will be processed on first come, first served basis. Promo delivery dates - items sold during Promo period are delivered within 1 to 3 weeks, depending on availability and delivery destination. Wainman Hawaii reserves the right to change, amend, modify, suspend, continue or terminate all or any part of the above promo either in an individual case or in general at any time.